There were some excellent comics this year. In this first column I look at some of the favorite books I read this year, I talk about favorite writers, series and issues. I hope to have a Part 2 up soon, in which I highlight certain favorite artists (beyond the discussion below). If you're not reading comics written by Tom King, you're missing out on some of the best, sharpest, most interesting comics being written. This was the year I really become familiar with King's work, in particular his "big three" books Vision, The Sheriff of Babylon and Omega Men. 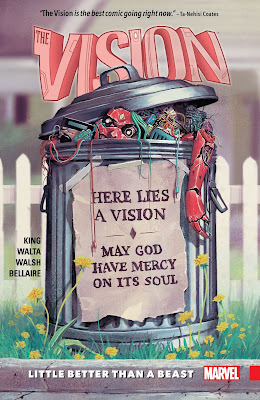 I was reading Vision from the beginning and in that book King does some incredible work, along with supremely talented artists Gabriel Walta and Jordie Bellaire. The book has an incredibly pervasive sense of existential dread throughout the series, and King's dialogue is some of the insightful I've ever read in a comic - I've loved his use of androids to make pointed observations about the nature of humanity. 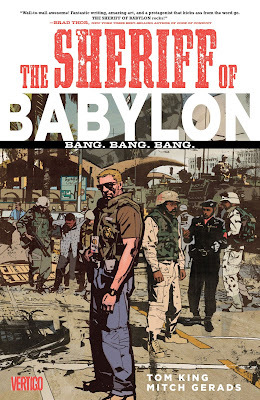 King has similarly talented artistic partners in Omega Men (Barnaby Bagenda) and The Sheriff of Babylon (Mitch Gerads). Each of those series is also among the best books I've read this year, shedding light on war and terrorism and realpolitik in a way that's both "big-picture" and "boots on the ground". Not to mention that King is also the current writer of Batman, and while I think that book has taken a little longer to warm up, the current arc is dramatic and exciting, and in the most recent issues, King provided an insight into Batman's psyche that felt genuinely new to me. For a 75+ year old character, that's no mean feat, but that's just the kind of talented writer Tom King is. Jeff Lemire is a busy guy. 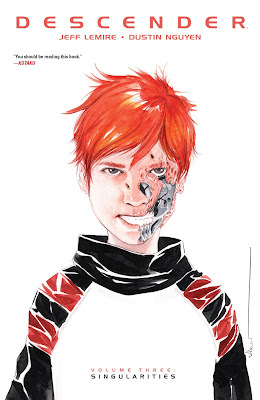 He's currently working primarily as a writer, with books at Marvel (Moon Knight, Old Man Logan, Extraordinary X-Men, Thanos), Valiant (Bloodshot: Reborn), and creator-owned projects illustrated by other talented artists including Descender and Plutona (at Image) and Black Hammer (at Dark Horse). 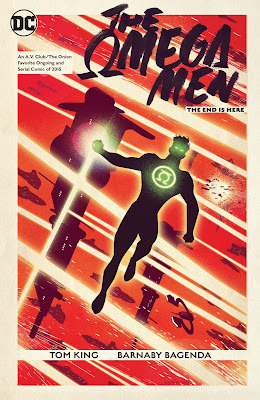 I don't read all of these books, but I read many of them, and Lemire brings a strong voice to all of those books I read. 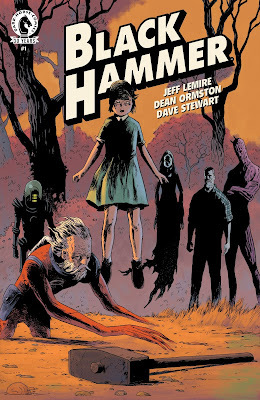 I recently reviewed Black Hammer, a book that I think synthesizes many of Lemire's themes of alienation and loss very well. 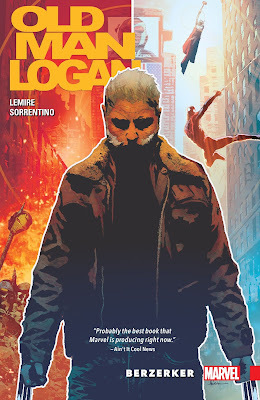 Those are also themes nicely addressed in Old Man Logan (with a man who's a loner to begin with, and now also a man out of time) and Moon Knight (about a man who's lost in his own mind). Lemire is an engaging storyteller, and in the books I mentioned (including Descender, a hauntingly beautiful and sad story) he tells emotionally fulfilling, engaging stories. By all accounts, DC Comics' Rebirth initiative has been a commercial success. I'm happy to say that, at least based on my own reading of a limited number of books, it has also been an artistic success as well. I'm reading more DC superhero comics than I have in a while, and I am absolutely loving Wonder Woman, Superman, Action Comics, Detective Comics and Batman. DC seems to have looked at what wasn't working in their New 52 initiative, and course-corrected in a strong way. 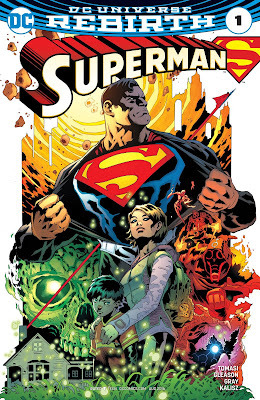 In particular, I don't think Superman was well-served as a character by the New 52, but DC has brought him back in a strong way by making the "old" (pre-New 52) Superman the current Superman. The element of having this Superman be married to Lois and their having a super-son has been a pure delight. 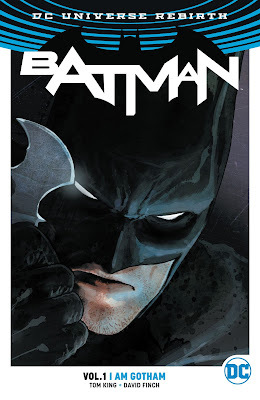 Batman from Snyder and Capullo was a highlight of the New 52 era, but even that book felt like it had run its course, and Tom King and James Tynion (on Batman and Detective Comics, respectively) have brought fresh voices and perspectives to the character. 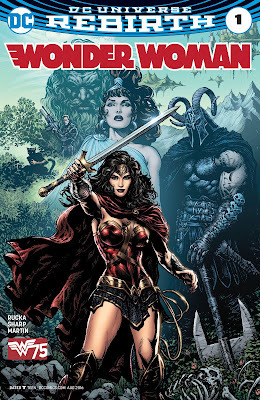 Wonder Woman was well served for much of the New 52 by the Azzarello-Chiang run, but seemed to decline after that time, but as part of Rebirth, Greg Rucka has brought a fantastic voice and a terrific double story deconstructing the lies and myths of Wonder Woman. Each of these books has also featured A-list artistic talent, and these books have felt like flagship books for the reborn DC. The Black Monday Murders is not only my favorite new series of 2016, it is my favorite overall series of 2016 (other than maybe The Vision). It's that good. I loved the first issue and as the series has gone on it's only gotten bigger, darker and better. It's a story about how dark magic is actually what fuels money and finance in the world, and the alliances, betrayals and bizarre rituals behind the power of Wall Street. I've reread each of the issues from this year a number of times and feel like I got something new out of them every time - that's a sign of a great book. I often describe Jonathan Hickman as someone who writes "comics for grown-ups". By that I mean he's not afraid to write stories with complex plots and subtle ideas and he gives a lot of information in his comics; he expects readers to be smart and to figure it out. 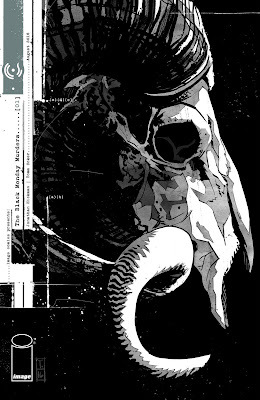 The Black Monday Murders does all of this very well; it's telling a big, intricate story with a lot of moving pieces, it's got a whole lot of morally gray protagonists, and it's telling a story about the secret history and powers of the world. All the while, it's wonderfully illustrated by Tomm Coker with terrific, thoughtful colors from Michael Garland. Coker has quickly become one of my favorite artists, and Garland returns to work with Hickman for another terrific collaboration. A fantastic, sophisticated read. 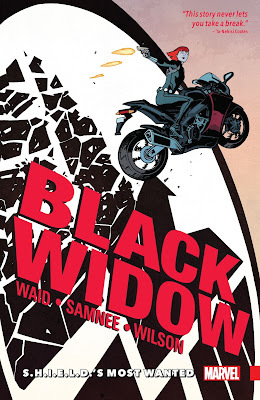 Black Widow has Mark Waid and Chris Samnee and Matt Wilson. I'm not sure there's anything else you need to know. The creative team (with some other terrific artists as well) had a run on Daredevil that was universally (and deservedly) beloved, so there was excitement when Marvel Comics announced that they'd be putting the band back together to create a Black Widow comic. Is it as good as their Daredevil comic? No. I'm here to tell you it might be even better. Each of the creators involved is operating at the top of their game. Wilson (one of the most versatile colorists around) adopts a completely different style and color palate as he creates a vintage, weathered look, and Samnee adapts his style as well, to tone down the humorous aspects of his style and amp up the tension. He creates some of the most exciting action sequences you've read in a comic, he's an absolute master of visual storytelling. And Waid is doing amazing work here; with artists as talented as these, he's making sure that the art tells the story (which make sense for a spy who doesn't speak that much). When the characters do speak, Waid and Samnee (who are writing the story together) have a great handle on Natasha and everyone else's voice. Like Daredevil, Black Widow is a Marvel book you can read without having to be too familiar with the goings on in the larger Marvel universe. 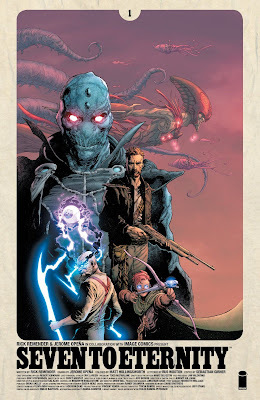 I really enjoyed the first issue of Seven to Eternity and my appreciation for the book has only increased since its debut. This is big, exciting science-fantasy adventure in the best tradition of Black Science and Low. Remender, together with Jerome Opeña on art and Matt Hollingsworth on colors, has created a detailed, lush, alive fantasy world. It really is some of the finest work I've seen from Opeña, and its complemented by Hollingsworth's vibrant colors that portray both the vibrancy of magic and the decay of this world so well. Remender returns to the theme of the lone individual standing for principle and against the decay or compromise in the world; it's a theme addressed here with interesting results, as Remender makes clear that the great and principled person may not always be right. The first 3 issues of the book appear to be setting up the premise for the overarching story of the book, and they're fun and dramatic and definitely one of the excellent debuts of the year. I thought a little about whether to include a series that's 2 issues in, but Violent Love starts with a bang and just keeps going. It's off to a strong, compelling, dark start, and it's definitely a book to watch for in 2017. Frank Barbiere is doing my favorite work of his since Five Ghosts (a book I absolutely adored); I think he does some of his strongest work in period pieces. Here he conjures up late 1960's/early 1970's America, and Barbiere (who's always a strong writer of dialogue) really nails the voices behind the colorful underworld characters and tough gals and guys that populate the first few issues. The story also has an interesting framing device that I'm sure will tie into the main story eventually. Thankfully for Barbiere, he's got a terrific partner in the talented Victor Santos. I really can't say enough about the work that Santos does in this issue. Santos is a highly skilled illustrator and visual storyteller, and he's got a style that's classic and compelling and funny and emotional. 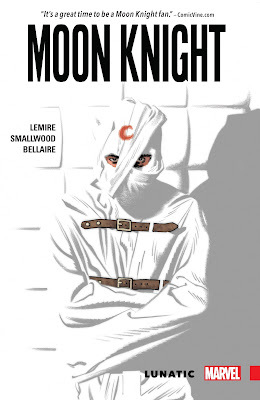 His work reminds me of that of Darwyn Cooke and Bruce Timm, in the dynamic illustration and layouts and the exaggerated faces and character acting; Cooke’s work also feels close given the crime story and 60’s setting. There’s also something in the faces that reminds me a little of artists in the mold of Daniel Bayliss and Paul Pope and Rafael Grampa; sort of a beautiful ugliness and also something that conveys motion, even in still moments. 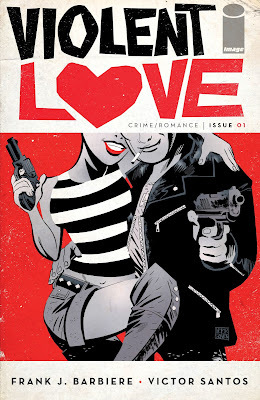 Violent Love is definitely a great read and a book to watch out for in the coming year. My criteria for what makes an ongoing book a "favorite" for me is whether I like the book even more at the end of the year than I did at the start of the year. 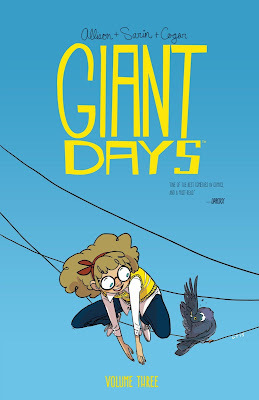 That is absolutely the case with Giant Days, a book that's got more intelligence and heart than most other more "serious" books out there, and some of the most memorable characters you'll encounter in a comic. You'll also find some truly terrific art from Max Sarin, who took over for Lissa Tremain. The art is comic and funny and exaggerated and moving and hilarious. The series continues to follow the adventures of Susan, Daisy and Esther, three friends at University, as they make their way through the first year and through the summer and into the second year. They have challenges involving dating and the perils of finding an off-campus apartment. This is not "end of the world" stakes, but what's wonderful about the book is that while it's an outlandish, hilarious comic, the emotions, the struggles, and life's small victories in the book always resonate as real. Each issue is (for the most part) self-contained and tells a satisfying story along with advancing the larger story. One particular highlight was the "what if" issue that examines what their life would've been like if they hadn't all become friends at the beginning. It's a moving issue, and another example of how this book keeps getting better and better. 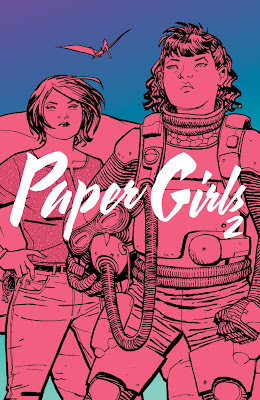 At the very beginning of this year I looked at the first 3 issues of Paper Girls. As much as I loved the book, my concern was that it was going to be a story that went too far into nostalgia. However, I needn't have had any such concerns, as while it's a book that began in the late 1980's (a time near and dear to my heart) it isn't about that at all. What is it about? It's about 4 fast friends thrown into a crazy science fiction adventure across time and (maybe parallel universes)? I think the true nature and scope of the story still have yet to be fully revealed. What I can tell you is that each issue is an incredibly satisfying read, and typically ends on a cliffhanger of some sort. It's written by Brian K. Vaughan, so you can trust that there will be fun dialogue and real, relatable characters. Moreover, it's one of the very best looking books on the stands today, with an A+ art team, in artist Cliff Chiang, colorist Matt Wilson, and letterer/designer Jared Fletcher. These 3 makes this book feel like a unified visual experience. Chiang's art is emotional and authentic, Wilson's colors are an integral art of the storytelling, and Fletcher proves fantastic design along with great, weird futuristic lettering. It's a fantastic, engaging read whenever it comes out. There are five Image Comics books I'm reading that I'm only briefly going to mention, but each of which is among my perennial favorite comics. Those are Black Science, Deadly Class, East of West, Lazarus and Saga. These books are essentially in my personal "Hall of Fame". Even if they weren't necessarily my choice for favorite book of 2016, each is a book that has been consistently excellent for a number of years. Each book also provided some excellent moments in 2016. 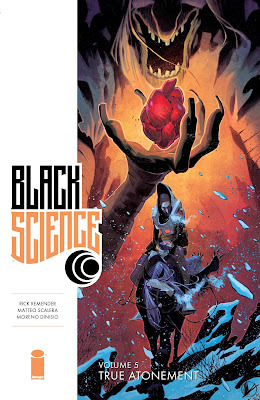 Black Science saw its hero finally return to his home Earth only to see things go horribly wrong for him. 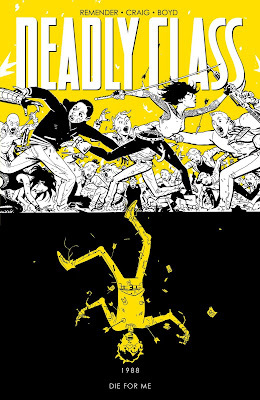 Deadly Class also had a genuinely shocking conclusion to its forth arc that I never saw coming. 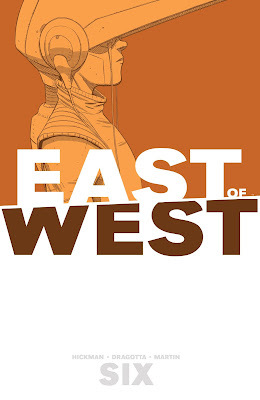 East of West saw the Apocalypse start to come to fruition, as war breaks out across America, along with a wonderfully emotional meeting at the end of the sixth arc. Lazarus saw hostilities turn into full-scale war between the Houses, as Forever Carlyle also learned shocking details about her past. 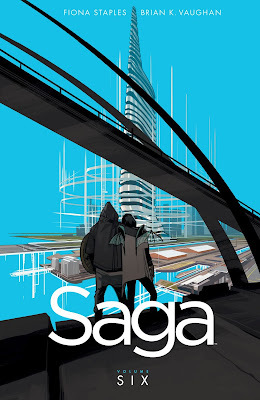 And Saga saw some of the heroes begin to come together, seeking sanctuary, and finding out that you can't really get away from your problems. 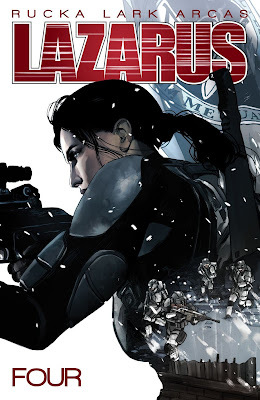 Each of these books feature fantastic writing (Brian K. Vaughan, Greg Rucka, Jonathan Hickman and Rick Remender) and art (Wes Craig, Michael Lark, Fiona Staples, Nick Dragotta and Matteo Scalera) from some of the best in the business. All are worth a read, and continue to be among my favorites. There are a few Marvel Comics books that have reached a "Hall of Fame" level for me, where they're not necessarily my favorite book at all times, but I love them and know that I can expect greatness from them. Those books are Ms. Marvel and Silver Surfer. Both are books that are at turns fun, dramatic, hilarious, poignant and thought-provoking. 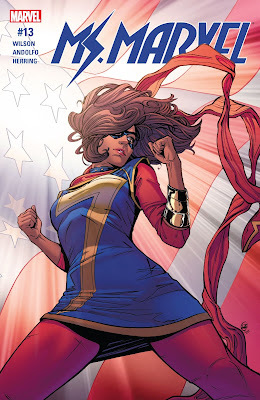 I've had mixed feelings about the ongoing Civil War II story-line at Marvel, but I thought that Ms. Marvel handled its connection to the event quite well, as Ms. Marvel (Kamala Khan) looks up to Carol Danvers and wants to please her mentor, but runs into conflict with her own principles and then has to make some pretty hard choices. She loses a mentor and a friend in the process, and the comic takes a fun and poignant trip to Pakistan where she regroups among family. As always Ms. Marvel is one of the best-written, engaging and profoundly moral books on the stands. 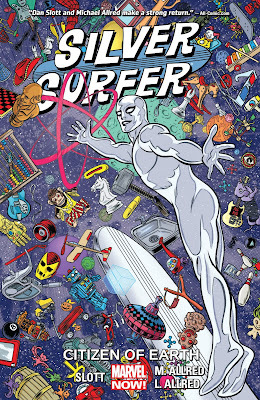 Silver Surfer continues to be a delight to read every month, as Dan Slott continues to write some of his most fun stories, and the incomparable Mike and Laura Allred deliver some of the most fun, delightful, energetic art you will ever see. As I told Mike Allred in person this year, I love the way that his and Laura's art has the ability to simultaneously convey joy and sadness. That level of art, and a terrific, emotional story, continue to make Silver Surfer a must-read. If you'd told me a year ago that one of my consistent favorite books would be The Flintstones, I would have laughed at the idea. 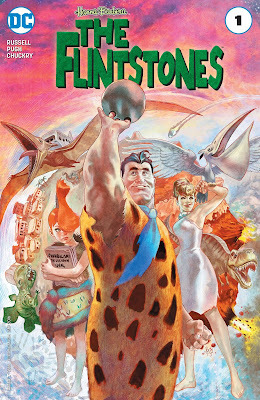 I enjoyed the Flintstones cartoon (and super sugary vitamins) when I was a little kid, but there was no way a comic about Fred, Wilma, et al. was going to appeal to me as an adult. I couldn't have been more wrong. Apart from The Vision and The Black Monday Murders, the smartest, sharpest, most pointed social commentary I read all year was in The Flintstones. Writer Mark Russell (who wrote the similarly sharp Prez) had no fear in taking on all sorts of topics ranging from warfare, the way we treat veterans, election politics, religion, lack of interest in science, consumerism, marriage, animal cruelty, and many other topics. But the book isn't a dry social critique, rather it's a brutally hilarious look at ourselves through the lens of "prehistoric" life. Steve Pugh and Chris Chuckry do terrific, hilarious, surprisingly emotional work in each issue. It is a humor book, and each issue is packed with great gags and visual humor. Every time a new issue comes out I think "I can't wait to see what they take on next". That's a sign of a great book, which The Flintstones is, along with bring my biggest surprise of 2016. When I looked at 4 Kids Walk Into a Bank #1 earlier this year I said that it is "the kind of debut that I want from a series. It's an issue that grabs you from the very beginning and doesn't let go. It's a book full of ideas and fun and personality, and it's a book that proudly wears its influences on its sleeve while creating something visually hilarious and compelling." 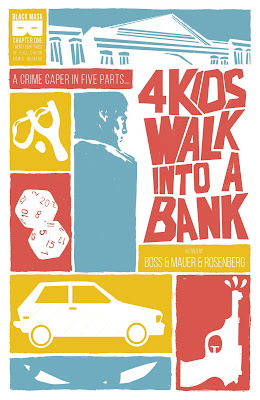 Even after reading many strong issues this year, none of that has changed, and the first issue of 4 Kids Walk Into a Bank remains my favorite single issue I read this year. Rosenberg is a hilarious writer, and he's got an amazing set of artistic collaborators, particularly the talented and versatile Tyler Boss. The amount of fun and wit and humor and clever cultural nods packed into this first issue make it such a delight, and I look forward to reading more of this book in 2017. After Death is one of the most ambitious, interesting comics I’ve read in a while. It’s a combination of traditional comic book, and prose text with accompanying illustrations. It seems to take place both in the near past, and in the distant future, and is a story both big and incredibly intimate. I don’t entirely understand what’s going on, but I completely trust the creators. 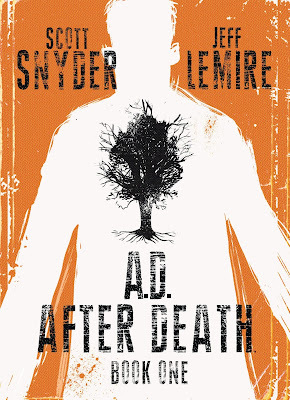 Scott Snyder writes some haunting, poetic prose, and Jeff Lemire is as good as ever with gorgeous, sad, watercolor illustration. His comic storytelling is first-rate, and his illustration that accompanies the prose portion of the issue lends the entire book a haunted, dreamlike quality. I highly recommend this issue and this series. Spider-Woman has been a terrific series the past few years as written by Dennis Hopeless, but what distinguishes this issue of the book is the sheer inventiveness of the art. 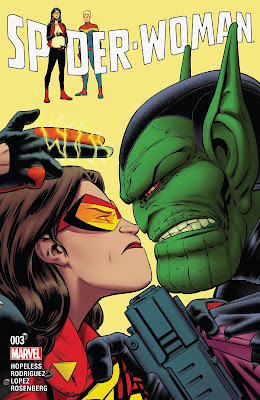 Spider-Woman (Jessica Drew) is trapped on an alien hospital, extremely pregnant, when the hospital is taken over by Skrulls looking to capture a rogue Skrull prince. This issue is an adventure as Jessica (again, very pregnant) eludes capture and attempts to save the prince and take out the Skrulls. The art team of Javier Rodriguez, Alvaro Lopez and Rachelle Rosenberg are at absolute peak form in this issue. This comic has some of the weirdest, most wonderful visuals I've seen in a long time, along with incredibly clever layouts that play with panels and the comic book format itself. I highly recommend this series generally, but even just this issue would make for a satisfying, trippy, gorgeous read. I'm a big fan of Box Brown’s work; I think he brings compassion and humor and rigor to his fiction and nonfiction storytelling, combining that work with his engaging, deceptively simple art style. In Andre the Giant he examined the life of one extraordinary individual, But in Tetris: The Games People Play he looks more broadly, from the game’s creator to the origins of the Japanese video game industry to corporate intrigue. He even makes software licensing come to life as a fascinating game of cat-and-mouse. 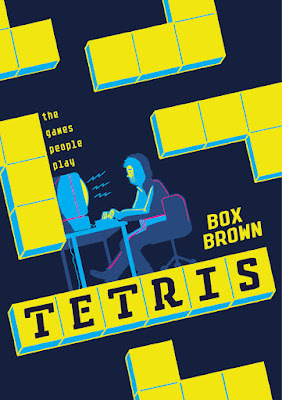 I was expecting the book to just be a biography of Tetris’ creator and was initially skeptical of the book’s broader scope, but then I realized that in order for Tetris to become the game that we know and love and have spent too much time playing (well, just speaking for myself), you need to know about the broader context. Brown brings his usual visual style and flair to this book; unlike Andre the Giant, this book uses color which works well when telling a story about something as vivid as video games. Brown's work here is inviting and accessible and he really brings the story to life, from drab Soviet offices to ancient civilization to the thoughts inside our heads, it's all illustrated with fun and insight and warmth.